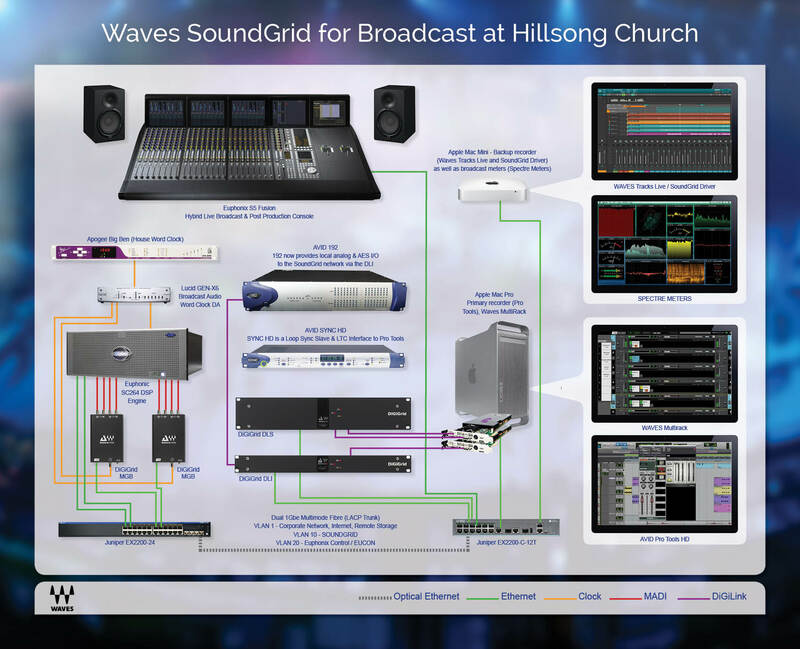 Learn how Hillsong Church enhances its live sound, broadcast and post-production capabilities by using Waves SoundGrid audio processing and networking. Hillsong Church is a Pentecostal church affiliated with Australian Christian Churches and located in Sydney, Australia. Hillsong Church has international campuses in New York City, Los Angeles, London, Paris, Amsterdam, Copenhagen, Stockholm, Barcelona, Cape Town, Düsseldorf, Konstanz, Buenos Aires, São Paulo, Moscow, Kiev, Lyon, and other cities worldwide. Hillsong Music has topped Australian charts, with albums achieving gold and platinum sales status. Hillsong is well known through its teaching, album sales and annual Hillsong Conference. Over 30,000 people attend services each week in Australia alone. 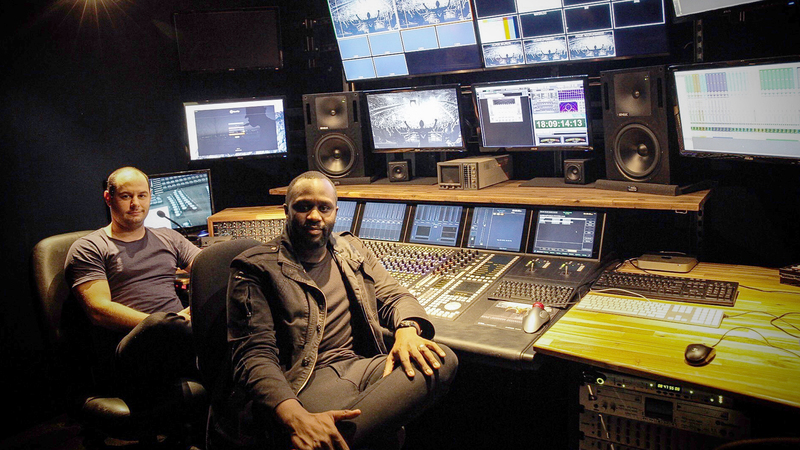 Ricki Cook, Director of Audio & Infrastructure for Hillsong’s Creative Technology Department, has designed Hillsong’s new live broadcast and post-production facility integrating state-of-the-art Waves solutions. The setup used by Ricki and the team at Hillsong is a great example of how combining various SoundGrid interfaces can help you network your editing DAW, backup recording system, and mixing console. The primary broadcast audio room is equipped with a Euphonix S5 Fusion console, a Mac Pro, a Pro Tools HDX system, and DiGiGrid DLS and DLI interfaces. Thanks to the DLS and the DLI, audio can now be distributed throughout the network, parallel to a second control room for backup recording and broadcast monitoring. 1. During broadcast, the built-in server of the DiGiGrid DLS is used to run Waves plugins via the Waves MultiRack SoundGrid plugin host application. 2. In post-production, Waves plugins run in SoundGrid mode via the Waves StudioRack host application within a Pro Tools HD system. This setup requires two ports on the DLS and one port on the DLI. The remaining DLI port connects to a spare Avid 192 for additional routable local I/Os. In each of the aforementioned setups, a 128-channel MADI stream is converted to a SoundGrid audio network via two DiGiGrid MGB MADI-to-SoundGrid audio interfaces. Together with a Mac computer, a Waves SoundGrid server and the Waves MultiRack SoundGrid plugin host application, this setup allows Ricki and his team to run Waves plugins in real time on the Euphonix S5 console. To extend his audio network cable runs, Ricki uses Juniper network switches that convert the SoundGrid Ethernet cables to optical cabling. 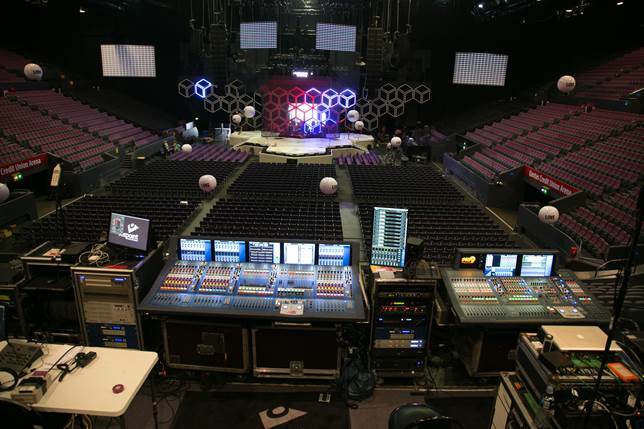 Hillsong also uses Waves solutions for mixing shows at major locations. FOH engineer Andrew Starke has been using the Waves MultiRack SoundGrid plugin host to run Waves plugins on Hillsong Worship tours. Andrew tours with several different consoles (Yamaha, Venue, Midas), and Waves systems are the perfect solution for the inevitable issues that arise when you need to work with different desks.